Welcome to the busy Downtown Diner where the chef prepares the fastest food in town and a roller-skating waitress lines up the orders to the rhythm of a classic jukebox. The local boxing hero is looking a little bemused at the arrival of the town’s other celebrity, the rock star, who seems to be soaking up all of the limelight as his pink convertible gleams at the curbside. Inside the diner, daylight floods through the large curved window, lighting up the spotless checkered floor, red barstools and clean counter top where you can enjoy a cool soda and the town’s best hot dog. Take the exterior staircase to the second level and you’ll discover a gym, complete with boxing ring, punching bag and a weight training room where the bodybuilder is going through her daily routine. Continue to the third level and you'll find a well-equipped recording studio with reel-to-reel tape recorder, vocal booth, mixing desk and a refreshments cabinet. This very cool addition to the LEGO® Modular Buildings series is home to a multitude of details, features and functions that will spark your imagination! Price is 24% below the initial Lego retail price, a € 40.00 discount! This comes down to 5.24 cent per brick. 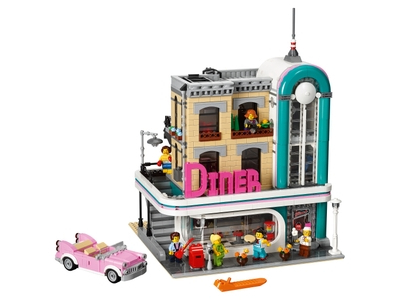 The Downtown Diner (10260) Lego set is available from the sites below. However, they do not offer delivery to your selected region. The Downtown Diner (10260) Lego set is no longer directly available from the sites below. However, 3rd party partners of these sites might still have the set available. Alternate description Discover a place where music is on the menu! Collect and build an entire town with the LEGO® Creator Expert Modular Buildings series 10243 Parisian Restaurant, 10246 Detective’s Office, 10251 Brick Bank and 10255 Assembly Square.